Rachel Allison is the new director at Greentree Learning and Child Care Center in Rolla, Missouri. Rachel’s goal was to create an inclusive atmosphere while promoting a healthier lifestyle for families. In 2017, Rachel participated in the Early Care and Education Learning Collaborative (ECELC) where she learned different ways kids can be active. 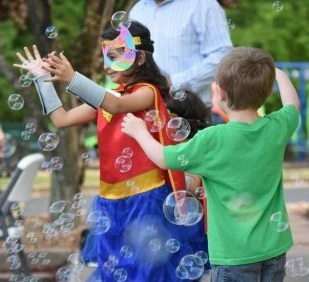 After discussing several options, Rachel and her staff decided to organize a family event, which involved a superhero-themed walk or bike ride. Rachel’s program hosted the “Daddy is My Superhero Walk/Bike/Trike” event on a Thursday evening where children and families were encouraged to dress as their favorite superhero. Rachel and her staff at Greentree Learning Center began setting up the one-mile course where families could walk or ride their bicycles and tricycles. It was an exciting, fun evening with a great turnout. All of the participants walked or rode their bikes for the entire mile with some going further. Moving forward, Greentree Learning and Child Care Center plans to offer similar events to families on a quarterly basis. They have also started a “Mommy and Me P.E.” program collaborating with a physical education teacher and gymnastics studio within their community. Rachel and her staff have seen the value in providing active events that are fun and support healthier lifestyles for families and staff. Staff at Brighter Day Child Development Center in St. Louis, Missouri, was allowing children to watch TV in the morning and afternoon around pick-up and drop-off time. When the TV was turned off and children transitioned to another activity, they seemed to have difficulty engaging with one another. A Taking Steps to Healthy Success coach talked with members of staff about her observations and challenged them to turn off the TV and supplement with physical activity. Nemours Children’s Health System created and tested an Implementation ECELC Toolkit intended for organizations interested in training ECE providers through a peer-learning, action-oriented model. Nemours is pleased to offer the Implementation ECELC Toolkit for organizations which want to plan learning collaboratives in their states and communities.